1. The general syntax for declaring an enumeration in C# is . 2. State True or False for the difference between classes and structures. iii) Classes are reference types and structures are value types. 4. Operator overloading is creating functions with special names, the keyword …………………… operator followed by the symbol for the operator being defined. 5. Match the following operators in C# with their description for the operator overload property. 6. 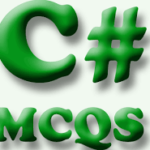 Match the following preprocessor directives in C# with their description? ii) #endif b) allows to undefine a symbol. 7. The operator symbols can be used for the conditional directives in C# is/are. 8. Conditional directives are beginning with a …………………. directive and must be terminated with ………………….. directive and must be terminated with ………….. directive. 9. The keywords provided by C# for exception handling are. 10. The ………………. block is used to execute a given set of statement, whether the exception is thrown or not.